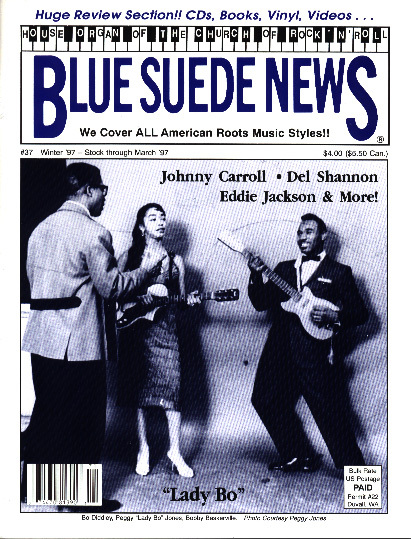 Blue Suede New #37: Lady Bo, Bo Diddley, Del Shannon, Johnny Carroll, Eddie Jackson, Ronnie Dawson, Rockabilly Ball, Rhythm and Blues, '50s Rock and Roll! Issue #37 - Winter 1996/1997 - Scroll down to order!! Blue Suede News #37 (Winter '96/97) has 68 pages with a slick cover. On the cover is Lady Bo with Bo Diddley. Lady Bo plays a mean guitar (way back with Bo) and the story about her life is called Lady Bo, Rock & Roll and R&B original, very well written and even provides you with technical data like open tuning information. There is also a story about a trip to Michigan to explore Del Shannon's life. One of the main features in this magazine is an extensive story about Texas rockabilly wild man Johnny Carroll, who recorded some of the wildest and craziest Rockabilly tracks ever ­ very informative article. Western Bop and Honky Tonk meets Rockabilly in the form of Eddie Jackson & The Swingsters, the article is titled Music with a Western Beat. In the movie section we get to read about Battle of The Bands, England and America Rockin' At The Movies (1957-1963) Part One. Movies mentioned in this essay are Rock You Sinners, Rock All Night, Carnival Rock, Shake, Rattle & Roll and others. Live music is covered by a feature about the Rockabilly Ball 1996 in Seattle, with pictures of the Sun Demons, Bughouse 5 and Ronnie Dawson.